Weight training and breathing seems so natural, I don’t really think about this a lot as I'm training. But there are a lot of questions asked on this subject, So lets cover some of the basics on the breathing issue. If you can simply remember to breathe out with effort, then on the opposite: inhale upon lowering the resistance e.g., while preforming arm curls. Breathe out when you curl the weight up through the concentric portion of the lift and breath in on lowering or the eccentric part of the exercise. The reason it's important in this order is: the lungs and surrounding muscles are contracting against this concentrated effort, stress from exertion negatively affects the natural breathing and pulmonary process. Weight training and breathing as mentioned is naturally easier for the body to inhale on the lowering part of the lift as there is less force initiated at this stage. The muscles, brain and central nervous system are all competing for oxygen at this point from the resistance. Breathing in as you lower helps expel more used or expended oxygen from your lungs, the exertion from each rep also assists in this pulmonary effort. This intern makes more room in the lungs as they prepare to inhale, assist and distribute the oxygen through the hemoglobin, this action ultimately does its job by, “Getting the oxygen to where it's needed”! The biggest thing about the breathing question in weight training is: make sure you breathe, don't hold your breath, this can have a negative effect by building excess pressure in the brain and organs. This increased presser from not expelling oxygen in the thoracic cavity (the space the lungs reside in), can sustain damage. Make a conscious effort of breathing as you exercise; oxygen is the vitality to life... weight training and breathing is also important in your ability to grow and enjoy this activity as a lifestyle. Weight Training And Breathing And The Lungs? 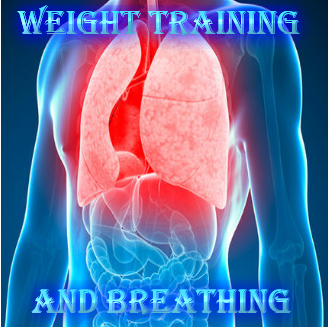 Breathing and expelling properly as you exercise has other benefits as it builds heart and lung capacity creating pulmonary strength and efficiency over time. Weight training is largely (anaerobic), meaning: without oxygen. The stress from resistance training acts not just on the heart and lungs as in (aerobics), the muscles affected are the real oxygen hogs in this type of training, often the more demanding the activity - so increases the demand for oxygen. This is why as we reach physical exhaustion in each exercise; the body simply can’t generate enough oxygen or transport it to where it is needed fast enough, 'hence' the rest between sets... to replenish oxygen stores. Weight training and breathing correctly strengthens the efficiency of the heart and lungs, even vessel wall size increases to accommodate for this new work-load, proper breathing also strengthens overall muscle response and endurance capacity. Just be sure to always breathe in any strenuous activity, I wish you the best with all your training days ahead and I hope you enjoy each and everyone with every breath you take; good luck.